Explore The Past 30 Million Years! Come join a professional guide, Fred Mazza, in exploring Florida’s ancient past hidden in the beds of our rivers. While wading in specially selected river beds in shallow waters you will learn to find and identify a variety of fossil material. You are guaranteed to go home with additions to your collection (or to start your new collection!). Appropriate for all levels of experience. Anyone with enthusiasm to explore the really old Florida is cordially invited! All tours are set up by reservation, not by regular schedule. Weekends and weekdays are available all year, just email us through our contact form or give us a call at (772)539-7005. Short notice? No problem, we’ll do our best to accommodate you! These tours are also suitable to large groups and schools who would like to introduce their students to Florida history and paleontology. Ask about discounted group rates for class/field trips. References available on request. Fees for our walk-in tours are $75 per person. Kids age 12 and under $50. Canoe fossil-hunting tours are $95. per person. Kids age 12 and under are $65. Private tours can also be arranged; please call for info. Pay by cash, US check on day of tour or through your PayPal account. We also accept Venmo. We do not process credit/debit cards on our tours. 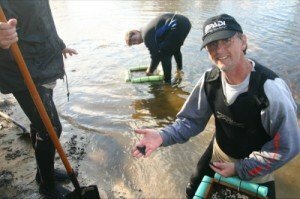 Fossil hunting expeditions generally take place on the Peace River in central Fla. and are approximately 2 hours driving distance from West Palm Beach, Vero Beach areas, 1 hour from Sarasota, Tampa and approximately 1-1/2 hours from the Orlando area. 1 hour from downtown Ft. Myers. We often visit the towns of Wauchula, Zolfo Springs and Arcadia. Transportation is not supplied. Tours last 5-6 hours, not including travel time. We usually meet at a pre-arranged location near the river at 9:30 am. We return to our vehicles about 3:30 PM. Directions to the meeting locations will be provided by Paleo Discoveries. 1. Clothing that can get wet and preferably dries easily such as bathing suits. Regular shorts and t-shirts ok. We suggest you wear things that you don’t mind getting dirty. 2. Closed footwear that is secure on your feet such as water shoes or sneakers w/socks. (More comfortable if sand and fine gravel get in.) Dive boots are great if you’ve got ’em. Flip flops, wading boots or any open shoes or sandals are not recommended because sand and gravel will get in them. 3. A wide brim hat, sunglasses and sunscreen are also highly recommended. We supply the equipment you will need to collect fossils (e.g., screens, shovels, etc.). We also supply life jackets and vests for our canoe tours. We usually have a snorkel or two on hand for you to use if the water is clear; if you want to bring your own, feel free. Bring your own lunch and drinks. A cooler is fine for our canoe tours, they will fit in the boat if under 30″ long. Don’t forget any allergy medications you made need. Do you like to canoe/kayak as well as fossil-hunt? Then join us on the river for a combination expedition! We supply the canoes to get you there and find the goodies. Canoes allow us to access more remote and often less collected locations, as well as take in more wildlife sightings and scenery. Canoe expeditions are $95. per person; kids 12 and under $65. Canoes seat 4 people. PLEASE NOTE: All minors must be accompanied by an adult. Keep in mind that fossil hunting expeditions are in essence field trips. Canoe trips are not recommended for children under 5 yrs old. NOTE- Florida state law requires a fossil-hunting permit to collect vertebrate fossils (shark teeth excepted) on state lands and rivers. We have a group permit to cover you while participating on our tours. Invertebrate fossils such as sand dollars and shells do not require a permit. ADDITIONAL NOTE: Florida law prohibits the collection of archeological (Native American) artifacts on all STATE (private exempt) lands and rivers without specific authorization. This law was recently enforced! (Feb. 2013) Paleo Discoveries abides by this law and does not actively collect any archeological artifacts of any kind.